This week past at the museum was pretty interesting. A student from the School of the Art Institute of Chicago, Andria, also comes in on Wednesdays for specimen preparation. She comes in two days a week for class credit. She had come in last semester and took a break over the summer. Her interests in art and natural history make for excellent company, and she has become quite adept at making bird skins. She had Dave open up the cabinet that was holding the latestest specimens that were collected from his trip to Malawi. She was quick to point out one of her favorites, a Lilac-breasted Roller, and with good reason: the color was astounding. It looks like a crow that got hit with a color truck from 1985; turquoise, cobalt, lilac, mint green. I'm hoping to do a painting of it. It'll give the new set of watercolors a good workout. Dave started grabbing specimens from the collection for a presentation he was giving later in the evening. I hovered and nosed around as he carefully laid out some of the poster children of avian extinction: Labrador Duck, Great Auk, Carolina Parakeet, Passenger Pigeon, and that much debated avian Lazarus, and ghost of primordial Arkansas swamps: Ivory-billed Woodpecker. It was strange to be near an object that was once a living creature, but is now the only evidence of a species forever wiped from the face of the earth. 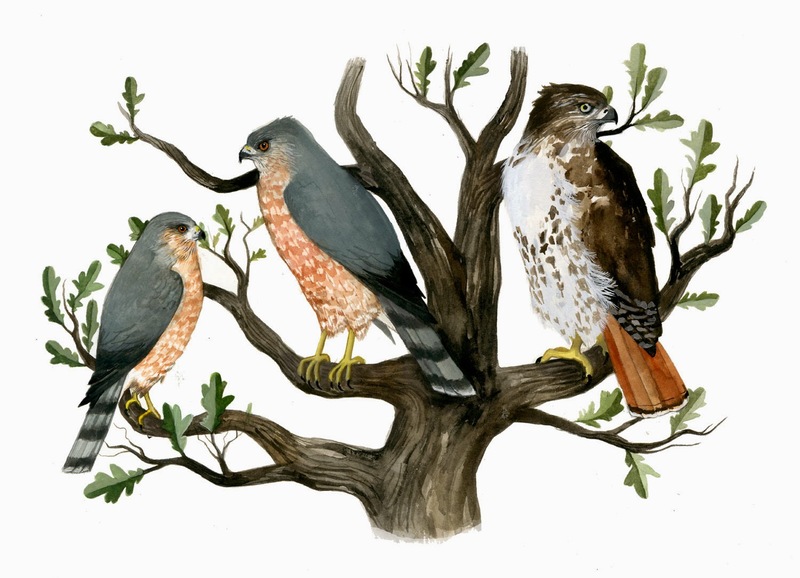 Each met their end either to gross over hunting, habitat loss, or both. An excellent and moving book chronicling the demise of some of the above mentioned is "Hope is the Thing with Feathers" by Christopher Cokinos. 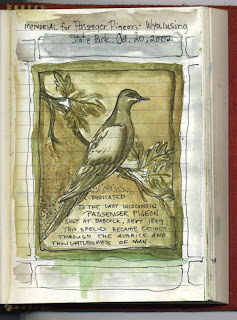 The painting of the Passenger pigeon monument, was one I made 5 years ago in a journal during a fall camping trip to Wyalusing State Park along the Mississippi bluffs of southwestern, WI. It must be one of the few (and first?) monuments to commemorate the time and place in which a species ceased to exist in the wild. The very last Passenger pigeon, Martha, died in a Cincinnati zoo in 1914. You're so privileged to be working at the Field, it's such a wonderful place. Love looking at one of your journal pages.